With companies like King Digital Entertainment, Airbnb, and WhatsApp receiving (or rumored at) valuations of $7 billion, $10 billion and $16 billion respectively it’s hard not to take a trip down memory lane, headed to 15 years ago. Now that we’re living in the age of “the internet of things” and Web 2.0, are we about to live through tech bubble 2.0? While it may look like some tech companies are in a bubble (it’s hard believe that with Airbnb could be worth more than Hyatt and that King Digital could already be worth double Zynga) there’s one big difference between the current market and the high-flying show that was 1990/2000: earnings. Back in 1999, it wasn’t unusual for a company with literally zero revenue to go public. Take the classic, ill-fated case of Pets.com. The company went from IPO to liquidation in only 268 days. Irrational exuberance wasn’t just extended to Pets.com and other flash-in-the-pan companies. Cisco was trading at a P/E ratio of 192 in March of 2000. Now Cisco had actual earnings, but not nearly enough to back up that kind of price (its almost impossible for any company to have it). Like all companies, that valuation was given based on the expected earnings of Cisco. Put another way, investors were valuing every $1 in Cisco earnings at $192. That’s just crazy, since even if Cisco tripled its earnings investors would get barely any return on their initial investment. It looks like this time may actually be different. For example, Google (a large-cap company roughly equivalent to Cisco in 2000) is currently trading at a P/E of about 30. That’s still about double the long-term P/E average of 15, but nowhere near the insanity that was the tech bubble. The chart below shows historical data on the Shiller P/E ratio from a great site called mutple, which updates the Shiller P/E and S&P 500 P/E daily. The Shiller P/E uses a broad measure defied as price over 10-year moving averages of earnings, so it isn’t exactly comparable to the P/E ratios for individual companies at any given time. While we aren’t at historical lows by any means we’re also nowhere near the bubble of 1999/2000. While there are a few companies whose valuations are based more on hype and expectations of enormous profits down the line, the market as a whole is much saner than it was back in 1999. But keep an eye on the these broad P/E measures. If the Shiller P/E Ratio above 35 it means the overall market will have a significantly higher P/E ratio than Black Tuesday and the crash of 1929. But as long as companies keep backing up with valuations with real revenue and GAAP accounting practices we shouldn’t have to worry about having to do any of these things ever again. Posted on April 1, 2014 by Jeremy Jacob. Posted on March 31, 2014 by Jeremy Jacob. In writing the second post in my “On Starting to Invest” series I realized that there was a more important topic that needed to be written about first, another concept I find fascinating: philanthropy. About 6 months ago I read a book that changed my life: Peter Singer’s The Life You Can Save. In the book, Singer lays out an argument for why all extremely wealthy (relative to the rest of the world) people should be donating much, much more to the plight of the global poor. The argument stems from a simple thought experiment. Say you’ve just purchased a new car, a shiny sports car that you’ve been saving up for for a while. You’re crossing some railroad tracks and all of a sudden it breaks down, right over the tracks. You immediately look to both sides and notice that there’s an oncoming train barreling down on you. You also notice something troubling: there’s a child stuck in the tracks. You only have time to either save the child or push your car out of the way. What do you do? You only have time to either save the child or push your car out of the way. What do you do? Count me among those who would save the child. I think many would consider themselves among those who would do the same. But here’s the thing, there are hundreds of thousands of children that die every day from preventable diseases. Almost half of the world (over 3 billion people) live on less than $2.50 a day. We’re just a lot more removed from them than if they were stuck on railroad tracks a few feet away. From a both a moral and Utilitarian perspective the concept of giving money away to the poor makes perfect sense. It’s the same basic concept that grounds progressive taxation systems around the world: the value of a marginal dollar is a lot higher for someone with few dollars than someone with a lot of dollars. Think of it this way, if you had no way to make a living but someone offered you $5 a day to feed yourself, you would find that $5 incredibly valuable. If that person offered that same $5 to a hedge fund manager they wouldn’t even notice it. You don’t have to be a hedge fund manager to consider donating to an organization that is either providing assistance to some of the poorest people on earth or trying to eradicate a preventable disease. Consider GiveDirectly, which gives cash grants directly to the global poor via mobile phone infrastructure or Schistosomiasis Control Initiative, which works to eliminate parasitic worm infections in sub-Saharan Africa. While both operate mainly in sub-Saharan Africa they also share another connection. Both are among the highest rated charities by GiveWell, an organization trying to upend how we analyze charity effectiveness. For more ideas here’s their current list of top-rated charities. If you’re thinking about giving, how much should you give? Singer recommends 15% of your income, but that’s pretty radical for most young people with an eye on the future. I’d say start by giving what you can, maybe tie your donations to certain holidays or large purchases. In a day when charities are as effective as they’ve ever been, even small donations can have an enormous impact. So if you’re in a position where you’ve got a secure source of income, a few months worth of emergency savings and are regularly contributing to your IRA or 401k, you should think about giving a little to the millions around the world living in poverty or contribute toward eradicating preventable diseases. The causes (probably) need that one extra dollar a lot more than you. 1/ Found an iPhone lying on the ground as I was leaving work today. An interesting thing happened to me last week. I found a white iPhone on my way home from work. I looked around to quickly see if anyone was looking around for one, but I didn’t see anyone who seemed to be looking around. The phone was locked, so I pocketed it and made my way home. Once home I checked the phone. There was a missed call and a couple emails. I started to look up how to return a locked phone to someone, as I was doing so a call came through. I picked up. Returning an item without knowledge of a reward is a strange concept when you think about it. I did not see a posted sign offering a reward for this lost iPhone, so it had no bearing on my decision to either keep or return the phone. In fact, if I had been a purely rational, self-interested actor I would have kept the phone and sold it. The fact that I returned the phone means that I wasn’t looking to get anything out of the transaction except for some good karma. I did a little digging in the concept of the reward and quickly found that etiquette, one of my pet interests, had something to say about the matter. (Recently a friend of mine let me borrow the literal book on the subject, Etiquette, which I highly recommend.) I did a little digging as to what it says on the subject and, well it depends. But I don’t think it should. The reward is not something that should be expected in our society. Making a good faith effort to return a misplaced item should be the norm. It makes sense from looking at it from an Utilitarian perspective: for most people the gratification from returning an item far outweigh the search costs to find the rightful owner, whose utility will be greatly increased by the transaction. 9/ Returning lost valuables should just be the norm. There should be no rewards. So, next time you find a missing item and return it to the owner out of good faith try your hardest (barring any physical violence) to refuse any reward. Tell them that as a way to pay it forward they can do the same when they find a missing item. That will be how we’ll build a society where doing the right thing is the norm and not something that has to be rewarded with anything beyond a profuse thank you. Posted on March 30, 2014 by Jeremy Jacob. Disclaimer: I am not an registered investment advisor and am not compensated either directly or indirectly for any investment advice. I’ve been an amateur investor for a while now, and what used to only be a personal hobby has slowly turned into a casual, pro-bono consulting service. It all started after I gave a presentation to a class at the end of college encouraging my peers to start investing now (at the beginning of their careers) for retirement rather than waiting a few years (or even a decade). This post has been adapted from a recent email conversation I had with a friend who wanted some advice on how she should go about her first investment. First off, many friends want to know how they should start thinking about investing. The world of investing can be daunting, so not knowing where to start is enough to leave many on the sidelines. As we’ll see below not thinking about investing at an early age can translate into big differences later in life! This “investment hierarchy of needs” chart details the most widely accepted view of the order of importance with which you should pursue investments. There’s a clear place to start: opening a retirement account. There are two big reasons why, if your employer offers a 401k, it’s by far the best place to start for young, employed investors: taxes and time. Paying taxes isn’t any fun (for most people), and paying the capital gains tax is even less fun than the money that comes out of your paycheck every other week. That’s because it doesn’t matter who you are, if you make above $33,000 a year, you’ll pay 15% of any capital gains you make (that is if you buy a share of Google at $40 a share and then sell it at $50 a share, you’ll pay $1.50 of the $10 you made in taxes). Given the long-term fiscal outlook of the US, it’s likely that this number will only increase with time. Here’s where a retirement account comes in. The beauty of a retirement account is that it’s protected from the capital gains tax. You can think of these retirement accounts as armored cars, your investments (stocks, bonds, etc.) as the bags of money inside, and any armed thieves are capital gains taxes. The second reason, time, is just as important. Take a look at the chart below and you’ll see why time (even 2-3 years) can make a huge difference when you get to retirement. The chart takes two scenarios, one person who starts contributing each year at 25 and another who starts at 35. The difference is substantial. If you’re a young person looking to invest but either a) aren’t employed or b) your employer doesn’t offer a 401k you can always start an IRA, which has a lower annual limit (we’ll get to that later) and no employer match. So, should you start a Regular or a Roth account? This will depend on your situation. With a Roth account you put post-tax dollars into the account and when drawing the income at retirement it won’t be taxed (neither income tax, nor capital gains tax). With a Regular account you put in pre-tax dollars and when drawing the income out at retirement it will be taxed (income tax, but remember, not capital gains tax). So if you think you’ll be in a higher tax bracket in retirement (either due to increased income or increased taxes, or both) then a Roth account is the way to go. If the opposite, then a Regular account is for you. These types of funds are an amalgamation of several different index funds (funds that track an index of securities) with a very low expense ratios (the amount an investment manager takes out as a fee). I recommend the Vanguard target retirement 2055 fund to most millennials. Vanguard has the lowest expense ratios by far. In addition, target funds will automatically shift its distribution of stocks vs. bonds as you move closer to retirement. For example, the 2055 fund is currently about 90% stocks and 10% bonds, this distribution will slowly start shifting more heavily towards bonds as 2055 gets closer. Stocks are generally more volatile in the short-term, but have a greater return in the long-run than bonds. This is of course assuming that you’re a passive, buy and hold investor who’s looking to be as diversified as possible at the lowest costs. As we saw in the graph, this is key! If your employer offers a match, even better! The best way to incentive this is to automatically route a percentage (at least the amount your employer matches, even better if you can put away more) of your paycheck to your account. 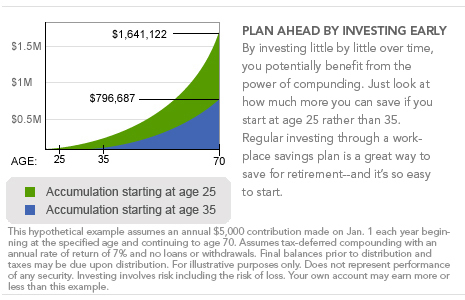 If you can, put the maximum of $17,500 into your 401k or $5,000 a year into an IRA. One thing that a lot of people don’t know is that you can add to your retirement account for the past year all the way until taxes are due (so you have until April 15, 2014 to contribute towards your 2013 retirement account limit). If you’ve already gotten all of that taken care of and you’re still hungry for more you can move up to the next level of the hierarchy, opening a brokerage account. I’ll go into some general strategies and guidelines on how to get some exposure to more specific industries or firms using your brokerage account in the next installment. But using the strategies in this post is all most people will need to start saving for retirement effectively. Posted on March 29, 2014 by Jeremy Jacob. Posted on March 19, 2014 by Jeremy Jacob. I’ve had this site up for a couple years now, but I’ve never been able to put it to good use. But that changes today! First, I hope this site will help me better consolidate my online identity. In this day and age of growing social media and interconnectedness, establishing an online identity and brand will only grow in importance in the coming years. So it will be a place to log my achievements (and failures), chronicle my adventures, and connect with others. Secondly, I hope that this will also be a medium where I can provide commentary on what I find interesting/fascinating/troubling/etc. in the world around me. I’ve been a faithful follower of many bloggers for many years, but have never thought I could actually do it myself. To that end, I also hope it provides a way for me to better articulate and keep track of my thoughts as they occur. My ultimate goal is that this becomes a repository and (subsequently a testing ground) for the random fleeting thoughts and ideas that pop in and out of my head throughout the day. Posted on March 15, 2014 by Jeremy Jacob.